Finishing the Annapurna Circuit left me a little sad. On walking out onto the Simon Guest House deck that morning I knew that it was the last time I would be looking out on the massif I’ve been circling for almost three weeks. The peaks remain infinitely interesting as the changing light creates shadows revealing intricate formations that disappear as the sun moves on. Also there is no clear endpoint like Bluff or Kirk Yetholm, which is as it should be — a circuit has no end. Still, I found myself hiking down from Ghandruk to Kimche only to discover a long, dusty road down to the main highway to Pokhara. Not a way to spend the morning so I caught a wild ride bus from there– much more stimulating than dodging trucks and scooters in the dust and the diesel on the road down. On the walk to Kimche, the trail was completely flagged with stones and uneven steps, and I passed many people bringing up materials to Ghandruk and beyond. No porters carrying refrigerators on their backs, but plenty of people carrying bags of rice or sugar, lots of plastic drainpipe, and a pack train of eight mules carrying up sacks of something. At an early stop on the bus, a strikingly beautiful woman in traditional dress got on along with three huge bags of dried corn–easily 100 lbs. each. She and the bus helpers (conductors? ), maneuvered them through the door and stacked them in the aisle, on the way to a market point about five km down the road. She seemed so slight but, like so many people living in a place where almost everything is carried by hand, she was strong and capable. Initially the road (not an accurate term) wound back and forth down narrow switchbacks with scarcely inches between the wheels and the edge which dropped off precipitously. It was like an amusement park ride, except here there are no regular inspections of the vehicle or the road. In this upper area tending to the flatland, there is an older architecture that is different from what I have been seeing. There are stone farmhouses, broad across the face with two stories. On either end are single-story rooms with sloping shed roofs, but the main house includes a bank of second-story windows with intricately carved casements and screens. The eaves have wooden brackets where they often hang ears of corn or basket materials to dry. Across the long face is a wide flat terrace where the farm produce is processed. After a long and winding ride down, the bus got to the highway at Naya Pol; then the driver opened it up, passing every vehicle he came near, blasting his horn, slamming his brakes, and swerving on and off the narrow middle band of pavement that made up the highway (the rest was gravel, potholes, and general rocky obstacles). This went on for quite some time until we arrived at the Pokhara bus stop, still quite a distance from the lake area where I had booked a hotel along with the rest of the tourists. Rather than a taxi, I opted to walk (guess I felt the need to make up for my short trek this morning) and spent an hour crossing the city past motorcycle repair shops, tailors, and open sewer/waterways. 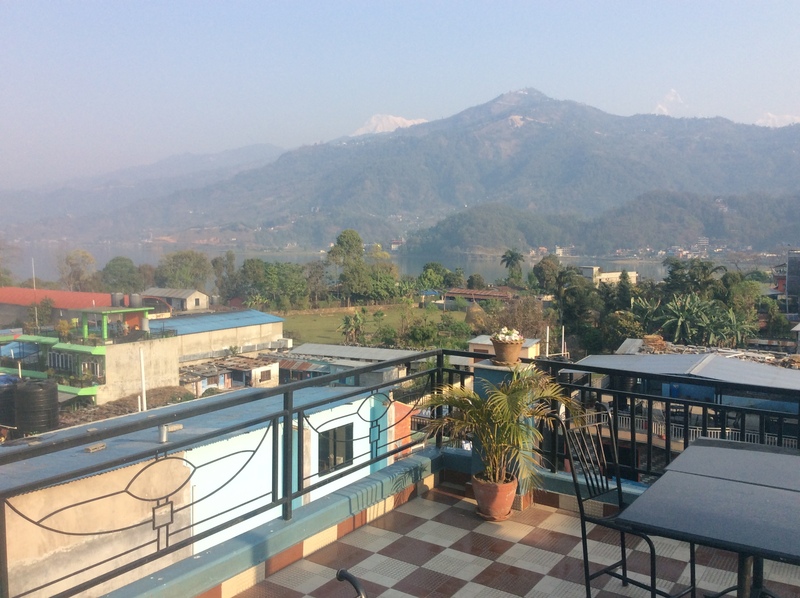 The Adam Hotel (booked via the web for good rate) is at the heart of the lakeside district near coffee shops, trekking stores, bars, and momo (dumpling) shops. A good place to unwind and organize the next adventure.